This past Wednesday, Council decided to table two motions with respect to the contentious bus lane: Ward 5 Councillor Chad Collins' motion to stop enforcing the bus lane and remove the signage, and Mayor Fred Eisenberger's motion to ask staff to look into options to fix some of the lane's issues. No decision will be made on either motion until January, when the staff report on the bus lane will be complete. So at least Council is waiting to see the results of the pilot project before deciding whether to continue it. It is imperative that Council keeps the big picture in mind when discussing transit. What kind of city are we planning for in 25 years? One that comes to a complete standstill if half of one highway is closed because people have no alternative to driving? How will we add 100,000 new residents if nearly all of them rely on single-occupancy car trips to get around? Nobody will be able to move anywhere in this city. Our transit ridership plummeted after the 1980s thanks to declining transit funding, and has stagnated for over a decade. Other, similarly-sized cities have much higher transit funding and much higher ridership. Cities that invest in their transit system with bus lanes, transit signals, higher frequency, more shelters, rapid transit and so on see positive results. Even Hamilton's under-funded, under-performing transit system was carrying 21 million passenger trips a year in 2008, or 70,000 passenger trips on an average weekday. Think of how many more car lanes we would need if all those transit riders had to drive instead. Now think of what would happen if another 100,000 people move to Hamilton and they all have to drive? Please read this insightful article about frigid, sprawled-out Calgary, a city that is often compared to cities in Texas. Pro-transit policies have not produced a dramatic move of businesses away from Calgary's center city - the fear many politicians and business promoters point to when complaining about limitations on automobile access to downtown. In fact, Calgary's office market is doing quite well, with five office buildings over 500 feet completed downtown since 2010, compared to just one in Dallas, one in Houston, and none in Phoenix. Calgary's downtown population has expanded rapidly to 16,000 people and now hosts 140,000 jobs and eight shopping centers. It should be noted that the Calgary municipal government has also played an important role in advocating for a compact city and directed local policies to support that goal. In other words, restricting automobile use and encouraging transit ridership not only don't hurt business - they may be encouraging it. ...[W]hile Calgary may be an exception to the rule when compared to many major U.S. regions, its experience has been similar to several other Canadian regions that have prioritized transit use even as they have grown spectacularly. Canadian cities from Calgary to Winnipeg, Ottawa, Vancouver, Montreal and Toronto each have significantly higher transit shares than you might imagine given their populations. Those cities each have also avoided the dominance of automobile use in their downtowns. In other words, these cities have visions for their downtown core neighbourhoods that involve more than just serving as a high-speed car shortcut to somewhere else. As a downtown resident, I am disheartened to hear talk from Hamilton civic leaders who see no value in our downtown other than as a highway. King Street can flourish again, just like Locke Street, Ottawa Street and James Street. I believe we can see the same on Kenilworth, Parkdale and Concession as well. Look at our suburban downtowns, which are thriving and healthy: none of them are highways. 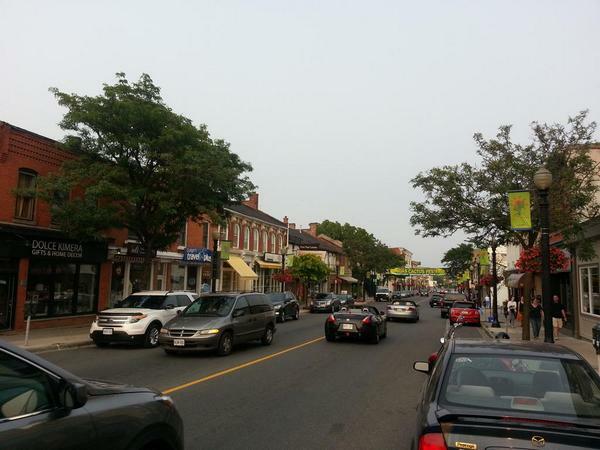 Do you think King Street in Dundas would be thriving if it was a four-lane one-way thoroughfare? Main and King used to boom with business, finance and prosperity. My vision for Hamilton includes this scene being re-born. Does yours? We should convert Wilson to a calm two-way street from Sherman to Bay, with one lane each way and parking on both sides. We should do the same with Wellington and Bay, and then drivers will have an easy option to and through downtown without needing to crowd King and Main. We need dozens of kilometers of transit lanes and transit priority signals in our city if we hope to grow and prosper. It's sad that the article on Calgary mentions other mid-sized cities like Winnipeg and Ottawa, but Hamilton of course has no business being mentioned in such an article. We are the outlier, the city still heading in the wrong direction decades after other cities figured things out. My wish is for Council to come into 2015 ready to make decisions that will be talked and written about in 25 years as catalysts for tremendous growth and success. The status quo has not worked, and won't work in the future. The reason why we're decades behind is because decades old councillors. Career politicians, like Chad Collins, only interested in clinging to power need to go or get with the program. 15% growth in population, 22% drop in ridership. File under Made-in-Hamilton Solution. Ryan would know this. Are those numbers consistent with the reduction in automobile use? As I understand it from prior posts, use of King West has dropped from 36,000 vehicles a day to 29,000. So the transit use figures may not be out of whack. The decline in transit ridership predates the decline in lower-city driving by at least a decade. It tracks precisely with declining annual transit funding. and driving city-wide is WAY up since 1991. In 91, it was the boonies south of the Linc. We are the only city that I can find in Canada that has seen transit ridership drop. The city has done nothing but devastate the HSR for the past 35 years and build nothing but wide, fast streets for single-occupancy cars, along with virtually all low-density suburbs with no options for walking, biking or using transit. Please define riders per capita. @DowntowninHamilton You are being unfair to Jason. He sometimes also likes Seattle! Ya... what a stupid idea to look at success stories from other cities so we might try out similar projects here. Best if we just repeat the same failures over and over for yet another 60 years. Give your own head a shake. Want an example of trolling? Making fun of contributors because they look to success stories for inspiration for our failed city. Get over yourself, times are changing and leaving you behind. So sorry! The engagement here is part of the civic process and has produced a lot of change and improvement, and continues to. One of the most basic rights of our system is the ability to address and petition elected officials. Not every initiative shared/published/promoted by this site has been successful. But the ones that were have significantly transformed many routes, intersections, and taken care of much "troubleshooting". I think it's very positive. People care enough about their neighborhoods and city to get involved. Mike, I agree with you. It's fair to go out and complain. It's what we do as Canadians. But, it gets tiring. Just like when I see the same bums out begging for change, then see them at the beer or liquor store buying up booze with that change they've received, I just stop paying attention. Just as an aside, I do care about where I live and do get engaged with the local community groups. Did it when in Corktown, doing it while in Rolston. There's a fantastic group of people up here and Clr. Whitehead's involvement and voice for us at council is much appreciated. Cool bro, we'll all just shut our brains off like you! HSR recorded 6,300 pass-bys in final quarter of 2013. Yes, 6,300 in 3 months. Vast majority of them happened on the B-Line corridor, with Barton having the 2nd most. No surprise to anyone. Yet, at the council meeting last year when the HSR recommended purchasing 60-foot buses instead of 40-footers, councillors questioned whether this was really necessary. I'm assuming this item passed, but don't know for sure. Also interesting to note that the James Mtn Road - Mohawk College route had the 3rd most pass-bys followed by the Jolley Cut routes. I've long maintained that our first N/S BRT should run up James Mtn Rd to Mohawk, east on Fennel to Up James, south to Mohawk, east to Upper Wentworth and into Limeridge Mall. City council is only fixated on the Upper James corridor because of behind the scenes influence from the land speculators and sprawl builders trying to make a case for AEGD. In reality, Mohawk College and Limeridge Mall are by far the largest drivers of transit rides on the Mountain. Phase 1 BRT using this proposed alignment would connect downtown with Mohawk, St Joes West 5th hospital, Mountain Plaza Mall, the busy Mohawk/Upper James corner, the high density corridor along Mohawk Rd and the transit terminal at Limeridge Mall. Put in BRT lanes and signals along with park and ride facilities at Mtn Plaza and Limeridge, and covered bike parking at all nodes nd watch ridership grow leaps and bounds. I once again used a city hall link, which now doesn't work. My bad. I forgot how user-unfriendly the internet was in 1998. Amazing that the city even gets these documents all uploaded through their AOL dial-up service. Great strong language used at times as well to warn the city about what will happen if we continue to grow our population, but not make other modes of transport attractive, safe and convenient. Yet, we have heard from councillors already this term who only want driving to be the convenient, safe, attractive way to get around Hamilton. So wish we had term limits. Also, a great stat in this report: Hamiltonians spend $680 million per year on gas for their cars. Council has zero vision to see the massive economic potential if even 1/6th of that total was able to be redirected elsewhere into the economy. It's a shame that there aren't basic requirements for a so-called public service job, such as understanding and cooperating with the city's own planning documents and goals.